I am glad to introduce my first WordPress Dj/Producers Theme. It includes everything that a Dj/Producer needs. You mange all your Gigs, Releases and Slides (Image Slider) with Custom Post Types. No need to learn the ropes of a new admin interface. The slider based on the Orbit slider. It has been modified with an own skin and a great thumbnail navigation. You can add unlimited of images to the slider, you can also set a image link. You manage the slides via a custom post type. You can add a caption (optional) to each slide and in this caption you can use HTML Tags and Shortcodes as well. The theme includes a full Gig Manager to show your visitors where you are going to play next. You can easily manage your gigs with a custom post and show your gigs schedule in a custom page. Set an image, event website and address for each gig. The user can click on the address and will be redirected to Google Maps. Create your own discography page in seconds. You manage your releases with a custom post type. You can upload a MP3 for each release and set a link where to buy/download it. Combine it with the Ultimate Dj Manager plugin and add the Music Player to your Discography Page, then visitors can listen to your tracks. The same widgets can be also used as single widgets! 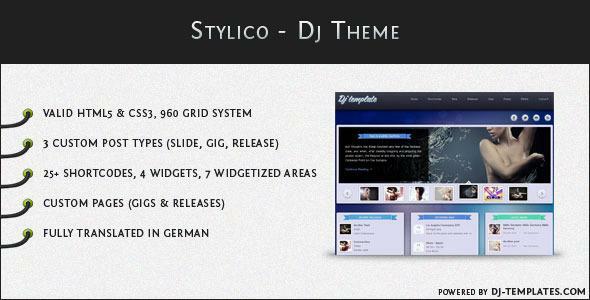 Share the post "Stylico – WordPress Dj Theme"